Our Funeral Homes Bereavement Center sponsors is sponsoring our 19th Annual Memorial Service & Tree Lighting Ceremony. 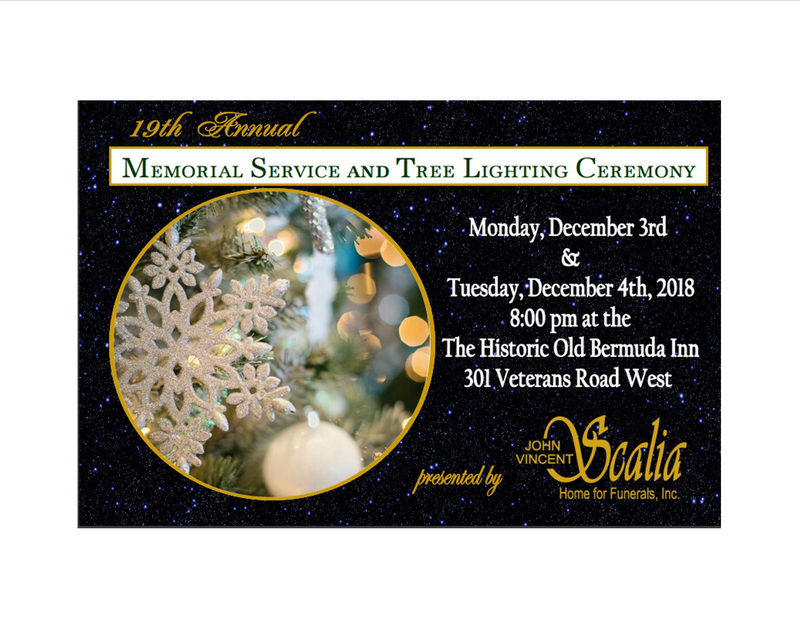 This ceremony will take place on Monday, December 3rd & Tuesday, December 4th 2018. The ceremony is about an hour long,and light refreshments are served immediately following the program. This evening is designed for each of us to take time out and in a special way, to honor the memory of those who have gone before us. Each of these trees is adorned with ornaments, selected by you, that hold a special meaning, known to you and you alone. They serve as a symbol, to remind us though they are gone, your loved one is not forgotten and their memory lives on. It is our sincere hope that the service offers you solace and comfort. We all gather here this evening united as one, with a common bond, that expresses more than words could ever say. As part of our continuing Aftercare Service, your ornament will be placed on the tree each year. We encourage you to come each year and share this special evening with your family and with our family. Monday, December 3rd, 2018 @ 8p.m. Tuesday, December 4th, 2018 @ 8p.m. Do we have your loved ones ornament? No, I will be bringing it to the Scalia Funeral Home by November 27th.--------- If we do not, we ask that you please bring in a Small—Non Breakable Ornament to the funeral home prior to November 27th, 2018, with the deceased name with it so we may label the ornament accordingly.